Ranikhet, literally meaning "Queen's Meadow", is a celebrated tourist spot in Uttarakhand. The gorgeous Himalayan mountain view in its full glory is best reflected in Ranikhet. Ranikhet is a cantonment town - it is home to the Kumaon contingent and Naga contingent of the Indian Army. At an elevation of 1829 metres above sea level, it provides an amazing sight of snow-clad Himalayas. Across nature lovers and honeymooners, the place is also a must visit for other kinds of tourists. There are many trek routes - small and big - that captivate adventure seekers. According to popular belief, Ranikhet got its name when Rani Padmini, queen of Raja Sukherdev, fell in love with this place and decided to make it her home. The British developed Ranikhet as a hill station for their troops and established a cantonment in 1869. Ranikhet experiences alpine weather. Summers (April-June) are mild and winters are cold (November-February). It experiences southwestern monsoon rains in July-September and experiences snowfall in winters. By Air: Pantnagar, at a distance of 119 km, is the nearest airport to reach Ranikhet. By Train: Kathgodam Railway Station, located at a distance of 80 km, is the nearest railway station to reach Ranikhet. Route 1: Delhi - Ghaziabad - Moradabad - Rampur - Nainital - Ranikhet, via NH 9. The distance is 370 km and it takes approximately 8 hours without any detours. Route 2: Delhi - Ghaziabad - Moradabad - Rampur - Bareilly - Haldwani - Ranikhet, covering a distance of 377 km. This route clocks 9 hours or thereabouts sans detours. Route 3: Delhi - Ghaziabad - Meerut - Kashipur - Ranikhet, via SH 12, panning a distance and time of 425 km and 11 hours, respectively. Route 1 is the shortest and also takes lesser time than the other two routes. Start from Delhi early in the morning to avoid traffic stuck-ups and reach Ghaziabad. You can visit the Dudheshwarnath Mandir, Durga temple and ISKCON temple in Ghaziabad. Moradabad, situated on the banks of the river Ramganga, is called Pital Nagari which means "Brass City". You can pick up brass lamp shades, vase, furniture or other decorative items from here. The deer park here is sure to delight children. If wildlife interests you, you can invest some time in visiting the Jim Corbett National Park. Be informed that this involves a diversion and a rather long one. Corbett National Park, one of the oldest national parks in India, is known for its Bengal Tigers, apart from the rich diversity of flora and fauna. You can book a safari and spot the transfixing and gorgeous wild animals like leopards, tigers, elephants, etc. There is also an option for elephant safari, which is offered if you book a jeep. Bird watching is famous here, with Corbett being home to more than 650 species of resident and migratory birds. Next, you can stop at Nainital before heading towards Ranikhet. This city is set around the pear-shaped Nainital lake, bounded with hills on all sides. The cable car ride to Snow View Observation Point to view the panoramic Nanda Devi peak, China Peak etc., and other snow-clad mountains is a must-do. Eco Cave Garden is a show stopper with children, where they can learn all about ecosphere. Nainital Zoo is a popular tourist spot where you can find rare species of snow leopard, steppe eagle and Himalayan black bear. Also check out Kilbury, which is a bird watcher's paradise. Onward to Ranikhet. Perched at an altitude of 1800 metres above sea level, this government-maintained place is known for orchards piled high with apples, peaches, apricots and more. Do engage the services of a guide to know more about other medicinal herbs and many special corners of the gardens. How about playing some ball in the chill? Upat Golf Course is one of the highest golf courses in Asia. It is looked after by the Kumaon Regiment. It is a nine-hole golf course where you can play with the pros or just enjoy the game. 3 km below the Chaubatia orchard is Bhalu Dam, a man-made lake constructed on the Kosi River. It was built as a solution for the water shortage problems. The dam provides water to nearby regions including Ranikhet. This lake is a great site for camping and picnicking. The Kumaon Regimental Centre Museum was established in the 1970s. It showcases many treasures like Jhansi Rani's silver sceptre, while also explaining the history of the Kumaon Regiment. This is a temple dedicated to Goddess Durga. It is full of bells and it is a belief that whenever a wish gets granted by the Goddess, a bell is tied in the temple by the devotee to honour the Goddess. After Sun Temple in Konark, Odisha, this is the second-most important temple that is dedicated to the Sun God. It is believed to be 800 years old. Located amidst the beautiful cedar trees, this is a temple that is dedicated to Lord Shiva. The architecture flaunts intricate and unparalleled workmanship. This temple was built by the Kumaon Regimental Centre. It has a gorgeous backdrop mountain setting. There is also a Gurudwara nearby that can be visited. Some of the other noteworthy temples are Dunagiri temple, Ram Mandir, Haidakhan temple and Kallika temple. 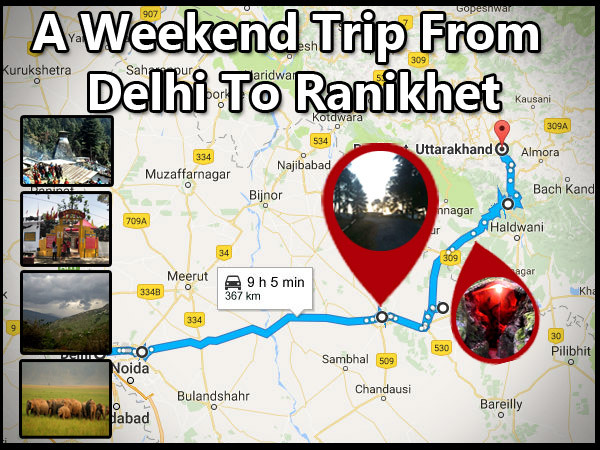 How To Reach From Delhi To Ranikhet?